New sailboats at this year’s shows are engineered for ocean voyaging, daysailing, gunkholing and everything in between. Our colleagues at Sail magazine helped us compile the following preview of boats expected to be shown in Newport, Annapolis and Miami. 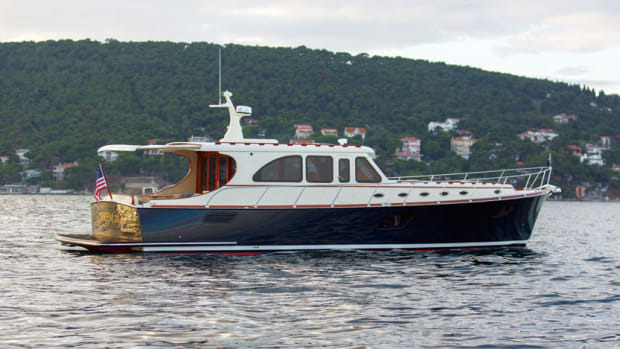 The French-built Wauquiez Pilot Saloon 48 provides a panoramic view of the outside world from a single-level deck saloon. The master stateroom is aft, with stowage and an en-suite head with a separate shower. The guest cabins are forward, and they share a head. 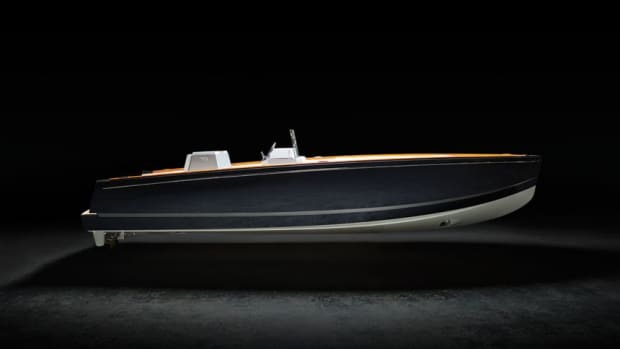 The Pilot Saloon 48 also has a dinghy garage aft, a robust hull and a powerful rig. The Hallberg-Rassy 412 has been available in Europe for a while, and the first hull recently arrived in the United States, where the Swedish boat is likely to attract plenty of attention. 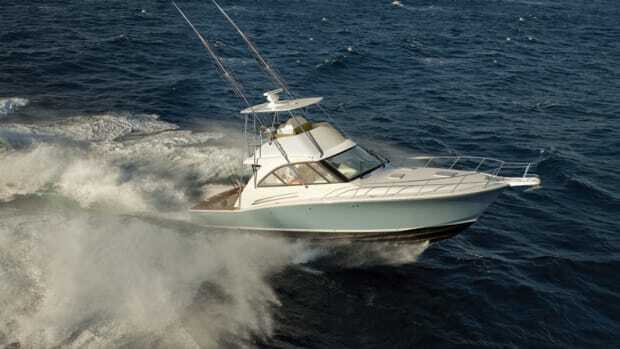 The 412 has an aft cockpit that can carry a small crew up the Intracoastal Waterway or across an ocean. A standard rig flies a slightly overlapping headsail for easy handling, and Hallberg-Rassy’s signature windscreen helps protect the crew in a blow. 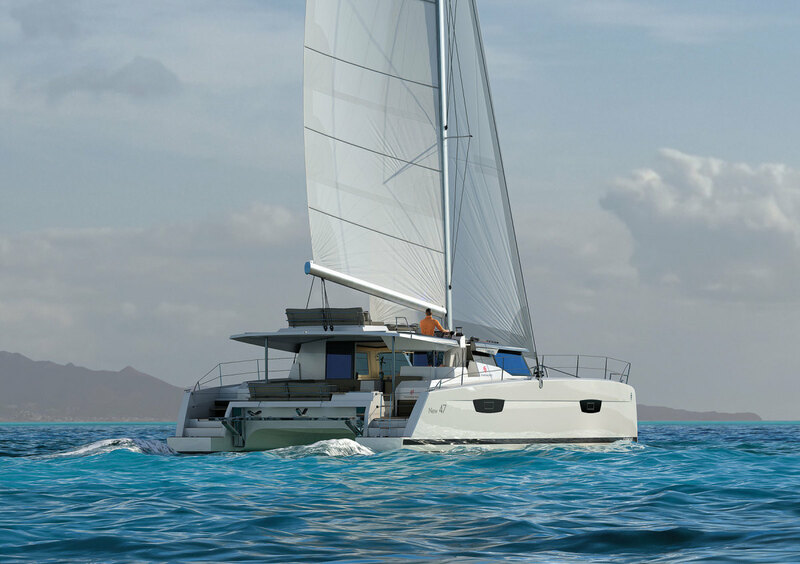 A concealed below-deck headsail furler and seven flush hatches reinforce the boat’s clean lines. Liveaboards and long-distance cruisers may want options such as a generator, washing machine, and bow and stern thrusters. From one of the most respected yards in the world comes the Nautor’s Swan 54, a bluewater cruiser that can take you just about anywhere. Not messing with something that isn’t broken, the Swan 54 marries moderate displacement and a vee hull form with Swan’s construction techniques. Finish work is outstanding, and the Swan 54 sails as good as she looks. Discovery has built some of the world’s ultimate bluewater cruisers. Its Ron Holland-designed Discovery 58 is the latest. The 58 is available with inboard twin wheels or a single wheel in the well-protected cockpit. Standard sail-handling aids include in-mast furling, twin headsails with a self-tacking jib and electric winches. The 58’s pronounced overhangs and moderate displacement/hull lines create a nice balance between speed and seakeeping capabilities. The X-Yachts Xc 38 is the latest in the builder’s cruiser line. With robust construction and quality joinery work, the Xc 38 has a deep, purposeful forefoot that provides a seakindly ride in rough seas. The layout is designed for a couple, with twin helms, a single rudder and a German-style mainsheet system. The plumb bow, graceful sheer and traditional transom add to her good looks. 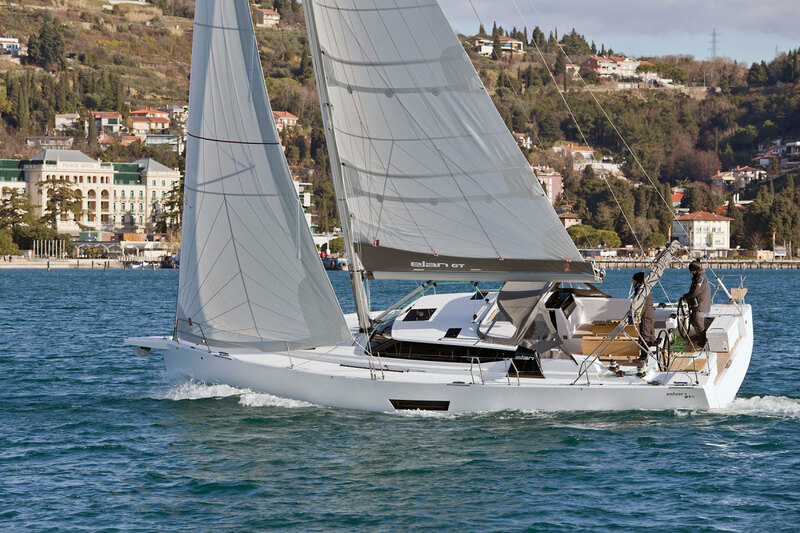 Slovenia’s Elan Yachts builds a wide range of racers and cruisers. 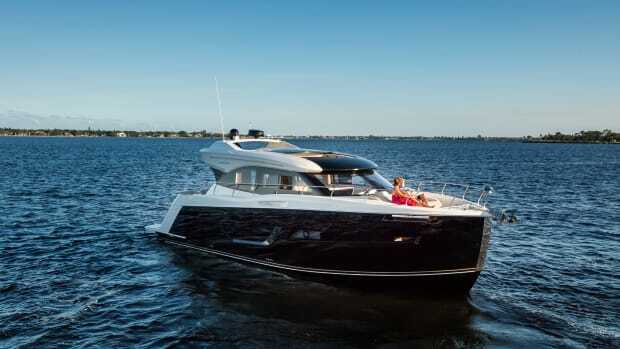 Its GT5 is the first in a Gran Turismo series of boats engineered to combine comfort and performance. On board this 43-footer are amenities often found on larger boats, such as a cockpit galley with a fridge, grill and other goodies. Forward, a cleanly engineered deck makes things easy for crew, and a cushioned sunpad is on the foredeck. There’s an “inverted” saloon arrangement, with the galley forward and 180-degree “skylights” beaming light below. Crafted of aluminum, the Boreal 47 is a centerboard cruiser from France that’s designed to look after its crew in any kind of weather. The doghouse/hard dodger incorporates a navigation station with wraparound views of the outside and has a clever vent that circulates outside air into the aft staterooms under the cockpit. The integral centerboard allows the boat to take the ground with ease. Concentrating the 47’s weight amidships, including a deep anchor-chain locker, provides a seakindly motion in strong seas. Twin daggerboards help ease steering loads, and a sprit is forward for running with light-air sails. 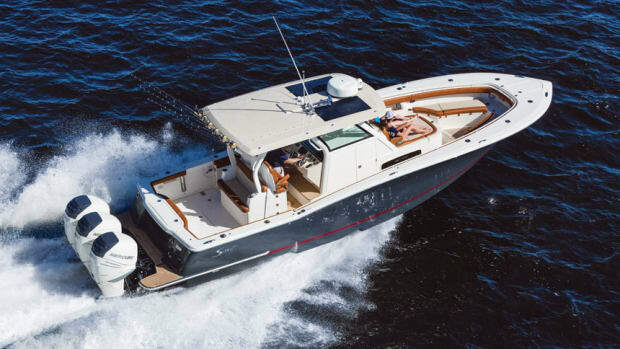 The Tartan 395 has a fast, seaworthy hull, twin wheels, moderate overhangs, a fully battened main and stout construction. It’s all packaged in a boat that combines past and present aesthetics. 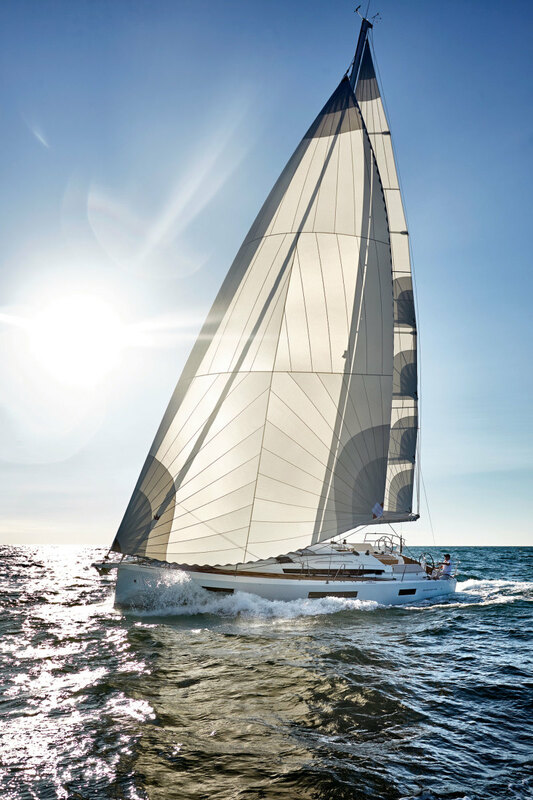 An extensive options list means buyers can order only what they need for their particular sailing style. Southerly is known for stout, fast bluewater cruisers. That tradition continues with the Southerly 540. 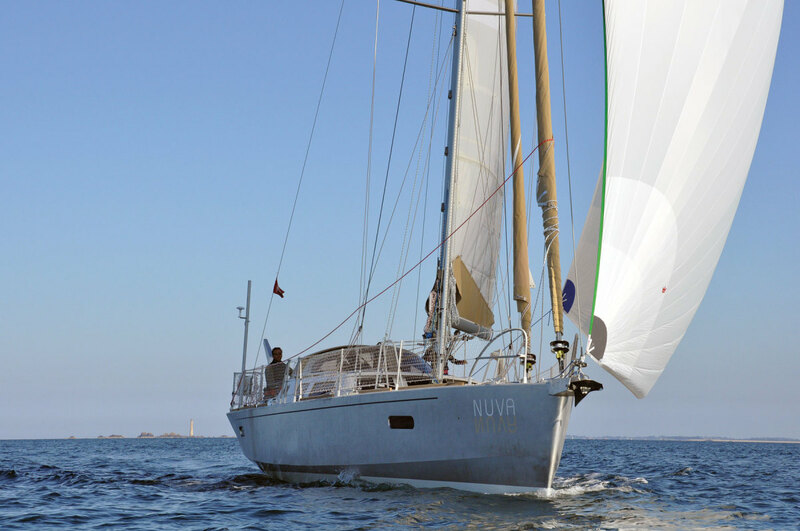 She has a tall, powerful rig with swept-back spreaders and a double headsail configuration to facilitate double-handed sailing. 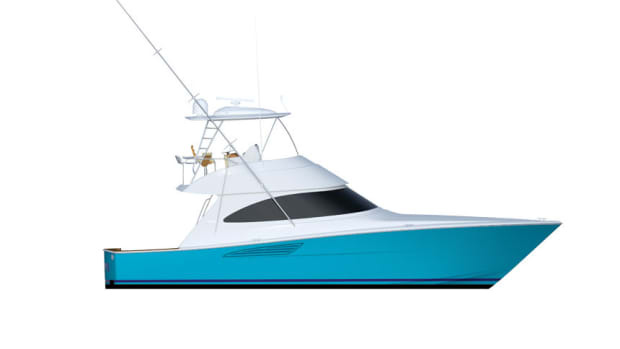 A variable-draft keel helps in shoals or shallow water, opening a world of inshore exploring. The Sun Odyssey 440 has inclined side decks that slope down around the twin helms, providing a safe and smooth transition from the cockpit forward. Other features include an asymmetrical cockpit with an L-shaped lounging area, room for a portable refrigerator inside the cockpit table and a low boom that helps when tending the main. 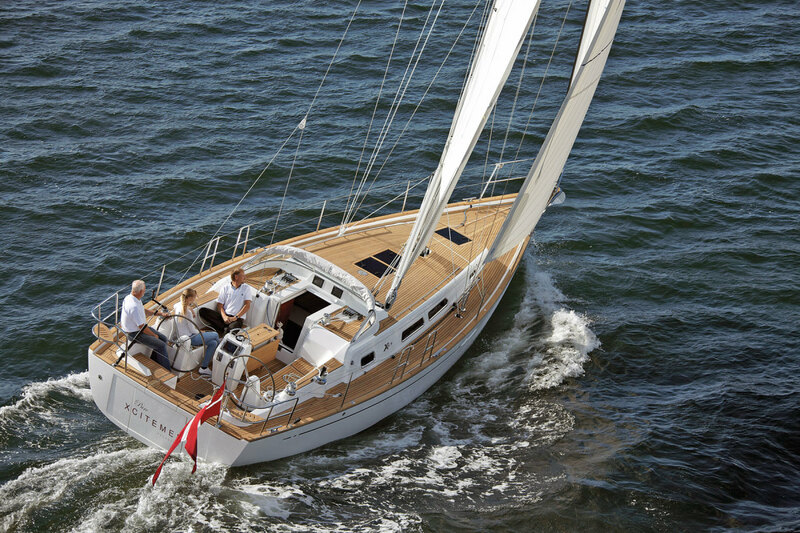 The Gunfleet 43’s center-cockpit configuration and non-overlapping headsail make this boat forgiving and comfortable in a seaway. Control lines are within reach of the helm to accommodate shorthanded crews and solo watches. 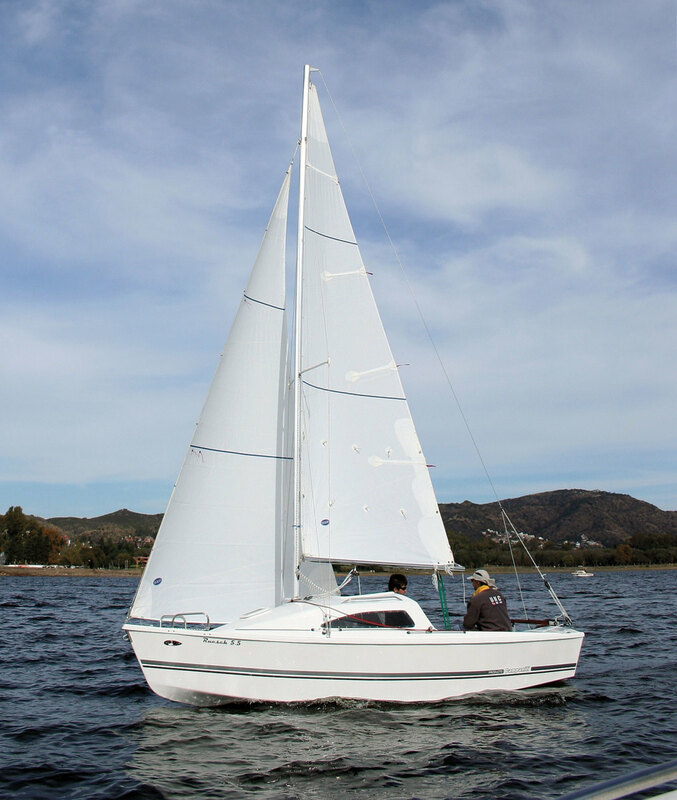 Twin rudders are standard, and a centerboard/keel arrangement is as an option. The below-deck accommodations include an en-suite master stateroom aft. The angled lines of the Beneteau Oceanis 51.1’s deck and cabin trunk are what first catch the eye, but even more noticeable is the stepped hull forward. Steps are a design element that has long been found on multihulls. The 51’s hull flares outward immediately above the waterline, creating a well-defined chine that allows for a roomy interior while creating a narrow, slippery profile under the waterline. 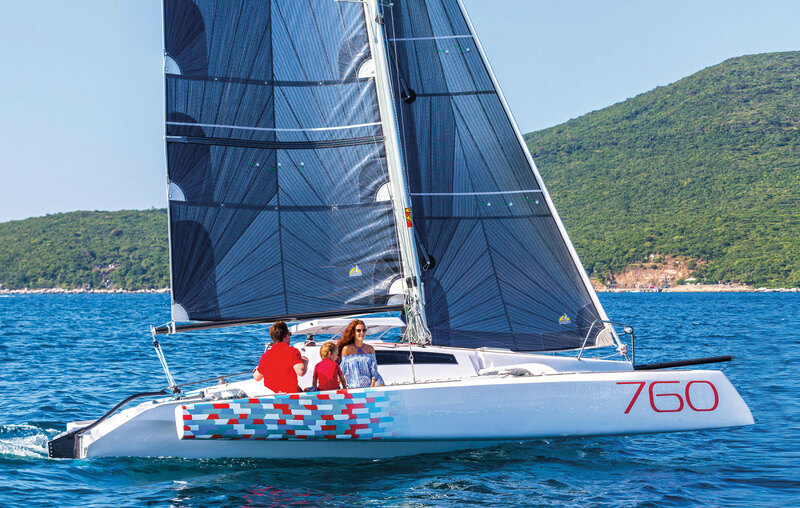 Performance-minded buyers may check out the First version, which is available with a taller aluminum or carbon mast that adds as much as 35 percent more sail area. That version also includes a deeper, highaspect keel with a lead bulb. The Fareast 19R has the same combination of performance and quality construction as its larger 28R sister ship, but at a lower price point. Highlights include a resin-infused hull, a T-keel with a carbon fin and lead bulb, a carbon rudder, tiller and tiller extension, and a retractable aluminum sprit. The 19R’s simple, backstay-free rig makes it possible to fly a square-top main. 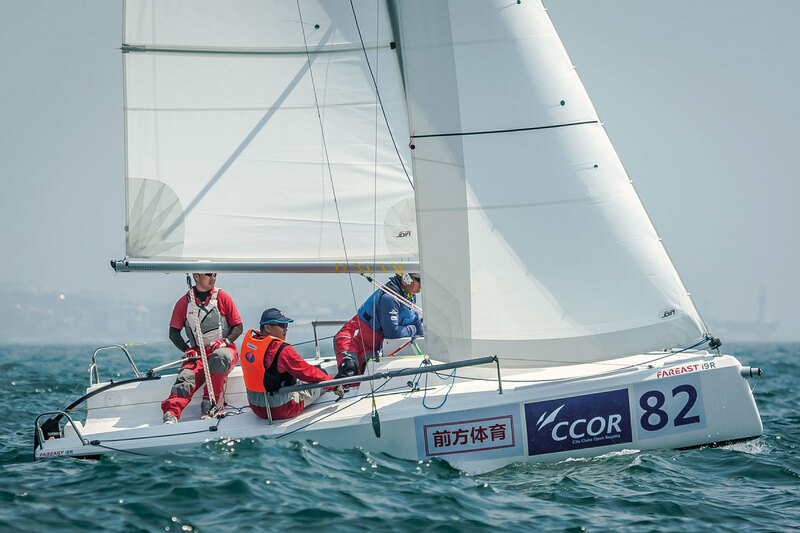 Fareast cut its teeth building top-quality foils in anticipation of the Beijing Olympics, and its build quality today remains strong. 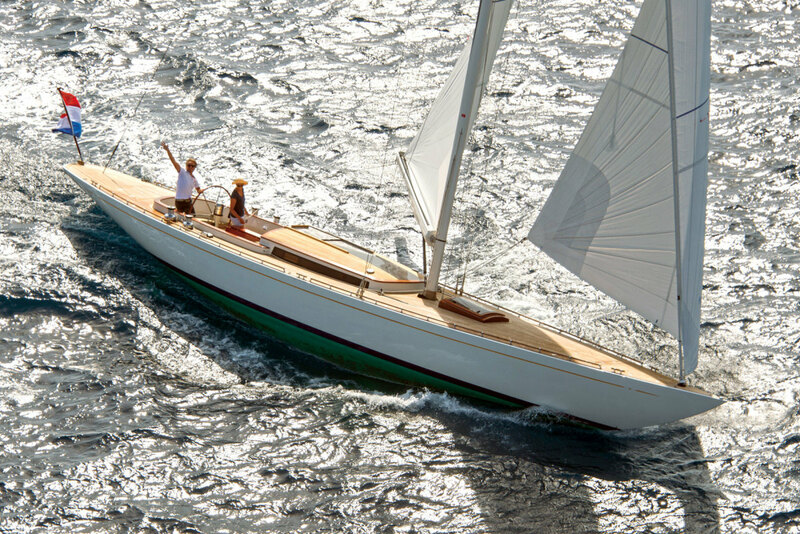 Designed like a daysailer, the Eagle 54 is a product of Holland’s Leonardo Yachts. The hull is constructed using epoxy with a foam core and carbon fiber in the frames. This provides lightweight strength and stiffness. Her high-aspect fin keel with bulb provides lift and sail-carrying ability, and all halyards and sheets are led aft beneath the boat’s teak decks, directly to the helm. 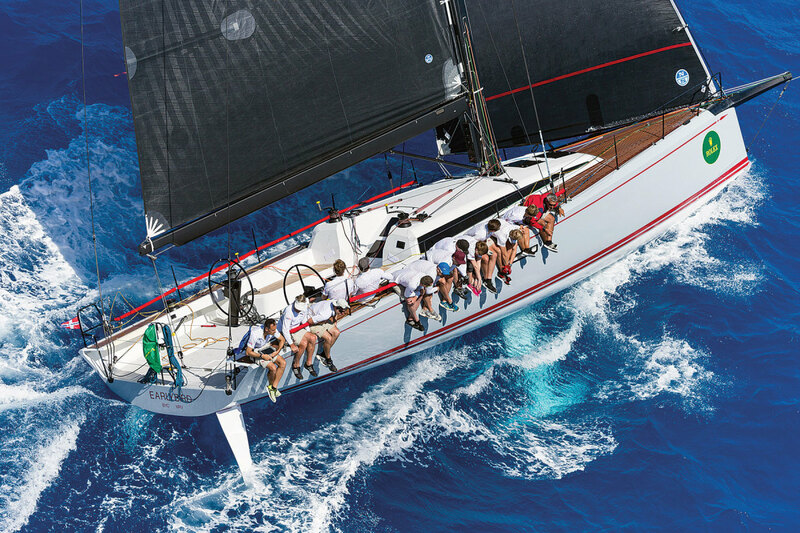 The Juan Kouyoumdjian-designed ClubSwan 50 is dramatic in terms of aesthetics and performance. Her reverse sheer not only looks good but also helps reduce windage at high angles of heel. Other gofast performance features include a high-aspect steel fin with a lead bulb, a lightweight tumblehome bow and sprit to help keep weight out of the ends, twin rudders, all-carbon construction for the spars and hull, and a hull that’s optimized to combine stability and planing performance. Teak decks are standard. At 15 feet, 5 inches overall, the roto-molded Hartley 15 is the latest design from Great Britain’s Hartley Boats. It’s a boat that combines speed with predictable performance under sail. The 6-foot beam provides a stable platform, while the high boom, vang and internal bench seating improve the ease of sailing. Other features include a center-mounted hoop that raises the mainsheet out of the cockpit, a self-bailing cockpit and an asymmetrical spinnaker. 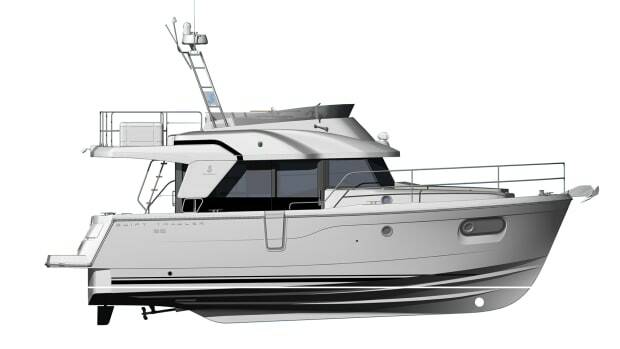 Drawn by designer Heraldo Norbert Ruesch, the Malbec 18 has a 6-foot-long cockpit, enough space below for a family of four and an optional slide-out galley with a sink. The rig and centerboard provide noteworthy performance, and the boat can serve as a smart club racer. The Malbec 18’s chines, graceful sheer and cabin top create a look that’s both sporty and purposeful. She’s trailerable, too. Prest-o change-o, it’s the Reverso: a performance dinghy that breaks into four segments that can fit into the back of a medium-sized sport utility vehicle. The builder says the boat reassembles without tools in minutes. This 11-footer from France can be sailed single-handed, or it can accommodate two adults, or an adult and a couple of kids. 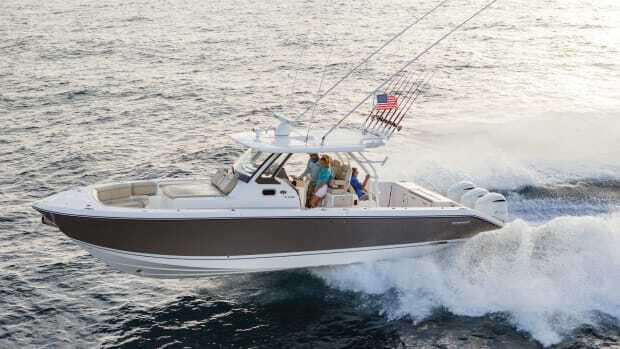 The boat has a performance square-top main, hiking straps, a tumblehome bow and flared hiking winglets for getting your weight outboard in a breeze. It weighs 165 pounds, making it portable. 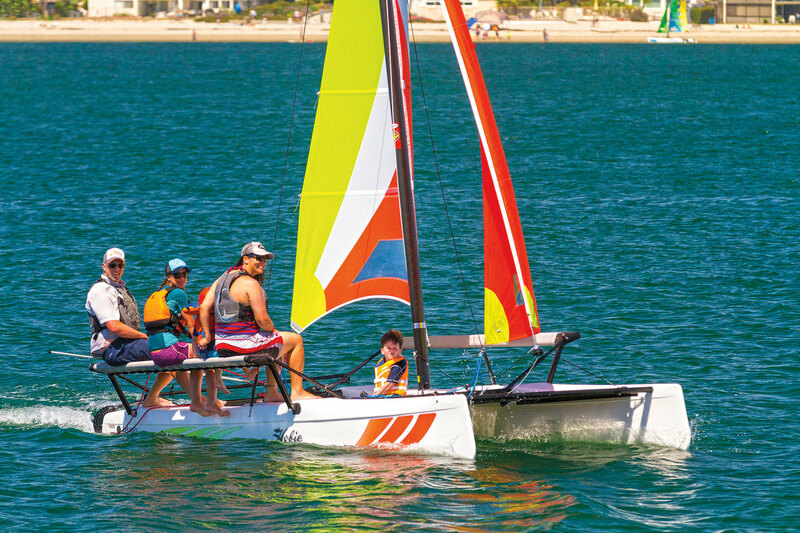 Hobie’s latest beach cat to receive an upgrade is the 17-foot Getaway. Wave-piercing bows and an extra 6 inches of overall length are intended to increase speed and carrying capacity. (It can now take six sailors.) Familiar features from the original Getaway include a roller-furling jib, EZ Loc rudders and a battened, boomless main. The Getaway’s hulls are roto-molded, keeping the design rugged and beachable. The HH55 is configured to provide what the builder calls an “exquisite amalgam of style, speed and manageability” in a fast, bluewater cat. Highlights include all-carbon construction, a Southern Spars carbon mast and a carbon V-boom. The HH55 can be ordered with three or four staterooms and a pair of conventional outboard helm stations aft, or a single helm station forward, near the base of the mast. She has a square-top main and curved C-style daggerboards. 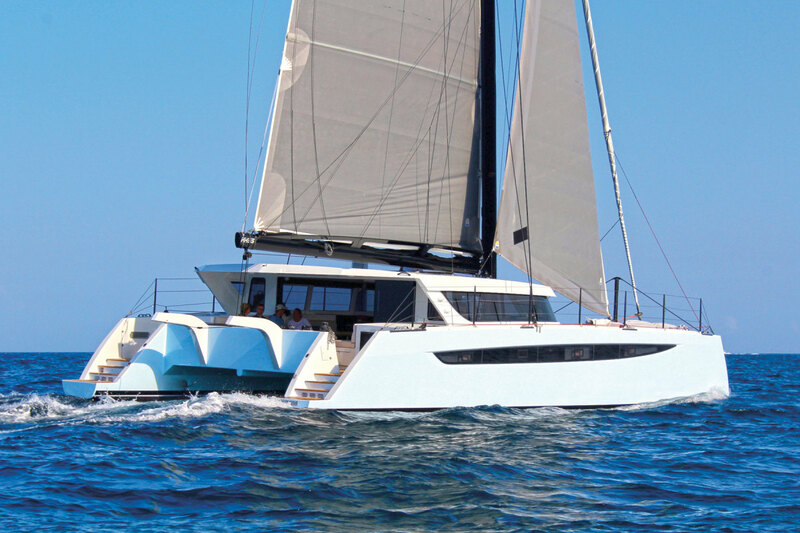 Fountaine Pajot describes the Saona 47 as the “quintessential catamaran for extended cruising or circumnavigations, offering remarkable space, safety, comfort and powerful performance in all conditions.” The boat aims to live up to that description with dramatic lines, expansive accommodations, socializing and lounging spaces, an open-plan cockpit, a forward lounge area and a “lounge deck” adjacent to the raised helm. The tender lift doubles as a swim platform. The Corsair 760 is an evolution, of sorts, of the Corsair 24. This trimaran combines wave-piercing bows and additional volume/buoyancy in the amas for speed and stability underway. The amas fold in for trailering. Sailors looking for even more speed in this length can order the Corsair 760 Sport version. It has a carbon mast and boom, carbon bowsprit and lightweight interior. Corsair has overhauled its 970 Cruze trimaran to create Sport and Carbon versions. 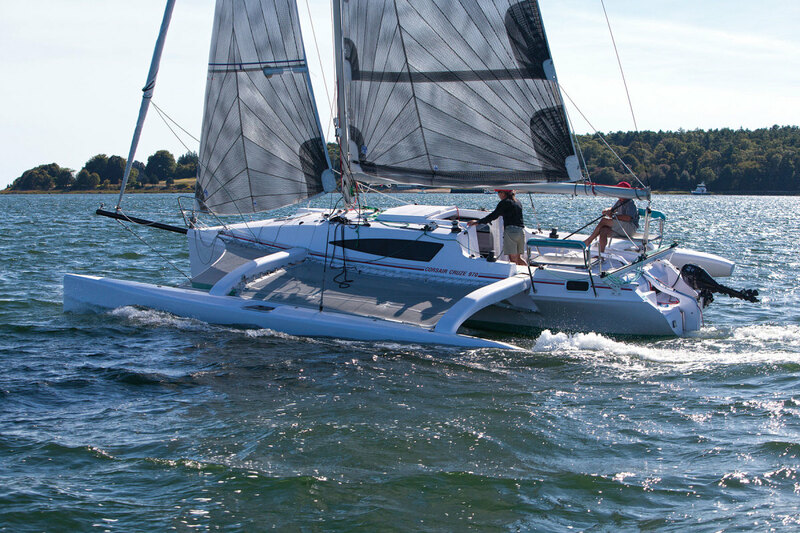 The Sport carries a taller, 44-foot aluminum rig with a more powerful mainsheet arrangement. A carbon rig is also available. The Carbon version has the carbon mast and full carbon construction. Both boats include the folding amas for which Corsair is known, making the boats trailerable. The first part of this article is located here.